Nourish your best friend with vital nutrition and 30% less fat when you fill her bowl with Bil-Jac Reduced Fat Chicken Recipe Dry Dog Food. 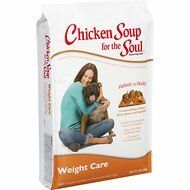 With fresh, farm-raised chicken as the very first ingredient, this super-premium recipe also features wholesome oatmeal and corn meal that are slow-cooked to produce low-glycemic, simple carbohydrates your canine companion can actually use. It’s fortified with essential vitamins and minerals to deliver complete and balanced nutrition for your adult dog, while naturally-sourced omega-3 and 6 fatty acids keep her looking as good as she feels with healthy skin and a bright, shiny coat. Fresh, farm-raised chicken is the very first in ingredient in this super-premium food that features lower protein and 30% less fat than Bil-Jac Adult Select food. Oatmeal and corn meal are slow-cooked to produce low-glycemic, simple carbohydrates to fuel your pooch’s energy needs. Proprietary Nutri-Lock low-temperature, vacuum-drying process extracts moisture from the ingredients without compromising the natural fats or nutritional value of the meat. Complete and balanced nutrition for adult dogs including naturally-sourced omega-3 and 6 fatty acids to help nourish her skin and give her a smooth, lustrous coat. Proudly made in the USA since 1947; never contains any fillers, gluten meals, wheat, soy, sprayed-on rendered fat, or protein concentrate. Chicken By-Products (organs only, source of arginine), Corn Meal, Chicken, Dried Beet Pulp, Oatmeal, Brewers Dried Yeast, Monocalcium Phosphate, Calcium Carbonate, Flaxseed, Choline Chloride, Sodium Propionate (a preservative), DL-Methionine, L-Lysine, Vitamin E Supplement, L-Ascorbyl-2-Polyphosphate (source of Vitamin C), Zinc Proteinate, Zinc Oxide, Copper Proteinate, Vitamin A Acetate, Copper Sulfate, Niacin Supplement, Biotin, Sodium Selenite, D-Calcium Pantothenate, Inositol, Manganese Proteinate, Riboflavin Supplement, Thiamine Mononitrate, Vitamin B12 Supplement, Pyridoxine Hydrochloride (Vitamin B6), Mixed Tocopherols and BHA (preservatives), Manganous Oxide, Cobalt Proteinate, Cobalt Carbonate, Vitamin D3 Supplement, Potassium Iodide, Folic Acid, Rosemary Extract. 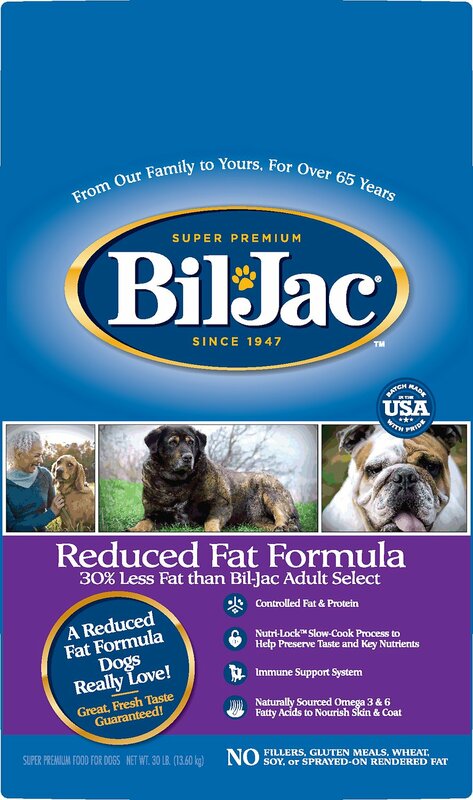 We recommend feeding Bil-Jac® Reduced Fat Formula on a scheduled and controlled basis. Most adult dogs may be fed once daily. However, twice a day feeding may be preferable based on specific needs. Use the feeding chart as a starting point. 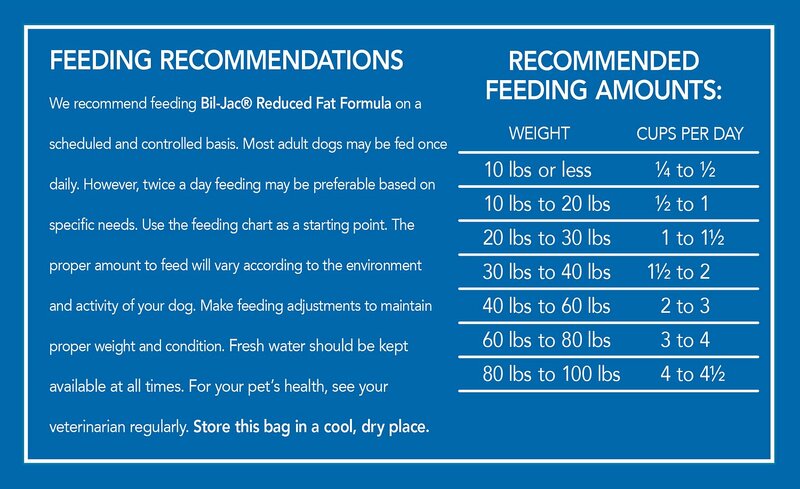 The proper amount to feed will vary according to the environment and activity of your dog. Make feeding adjustments to maintain proper weight and condition. Fresh water should be kept available at all times. For your pet’s health, see your veterinarian regularly. Store this bag in a cool, dry place. The folks at Bil-Jac don't rush when it comes to making high-quality food for your dog. No, they believe healthy food takes time. From their carefully selected ingredients to their slow-cooked and gently dried recipes, these animal-lovers take their time to create a dog food that puts nutrition first. 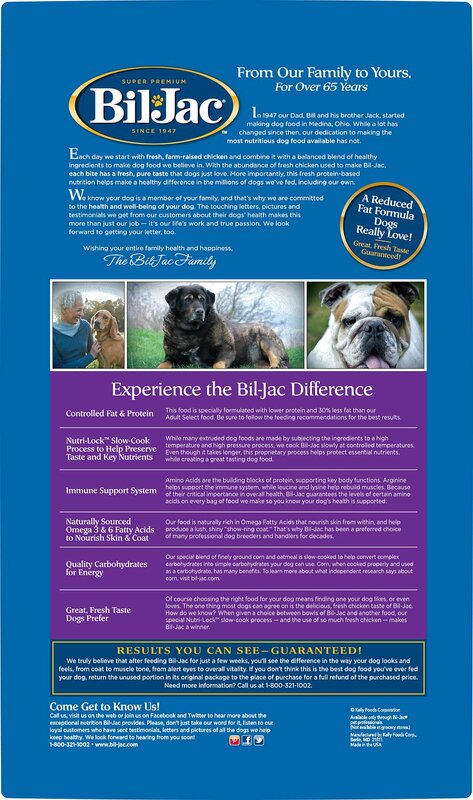 Bil-Jac looks so different because it is so different—and your dog will feel it, too. Bil-Jac builds their recipes on high-quality, fresh ingredients – like the 25 pounds of fresh chicken they use to make a 30 pound bag of Bil-Jac Adult Select. Their unique Nutri-Lock cooking method is like no other and allows them to use so much more fresh chicken, without using high-temperatures and high pressure. Instead they craft meals like you would in your own kitchen, for outstanding nutrition and mouth-watering taste. Not only will your dog's taste buds thank you, but so will his tummy—and so will your lawn. When you feed your pet a quality, nutrient-rich meal, his digestive system will thrive just the way it should. And, when your dog's stomach is happy, so are you. While you care about how nutritious your dog's food is, he craves another important thing: food he can't wait to eat.. And your pal will love the tail-wagging, delicious taste of fresh chicken in every bite of Bil-Jac. Don't believe us? Try the Two-Bowl Challenge. Place a small amount of your regular kibble in one bowl and Bil-Jac kibble in another - see which bowl your best friend empties first! 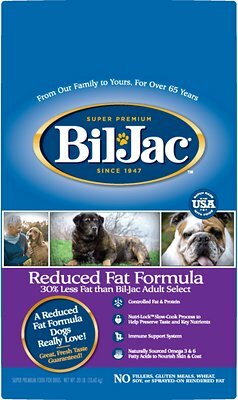 After 70 years of cooking nutritious meals for dogs, the people at Bil-Jac stand by every bag they make. They don't care about being the biggest manufacturer of pet food—instead, their goal is to provide the absolute best nutrition for dogs and keep tails wagging. They truly believe in their food, and they believe you'll see a difference in how your dog looks and feels after a few weeks eating Bil-Jac. After returning home from serving in World War II, brothers Bill and Jack Kelly began their mission to create a better pet food in 1947. They developed a completely new way to take large amounts of fresh chicken, cook it slowly, and then vacuum dry it to remove the moisture while keeping its powerful nutritional value. Today, they continue their commitment to nutrition with their ever-growing assortment of foods and treats. 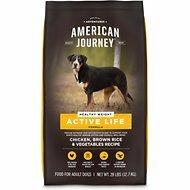 My dogs have had digestive problems with several foods. Seems the only thing they do well with is chicken. 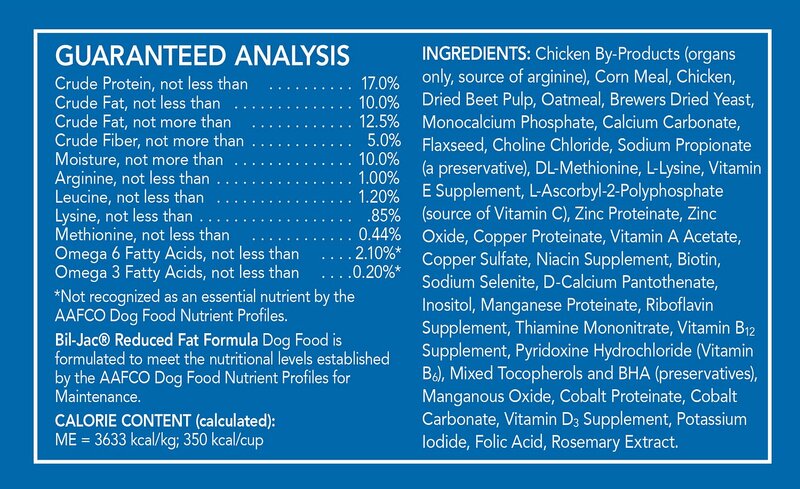 They don't need any extra fat, so the reduced fat formula is good for them, especially one with pancreatitis problems. Also, the food format with pellets instead of kibbles means they don't lose as much with Boxer jowls. They love the taste too. The most digestible dog food and all 5 dogs love it! 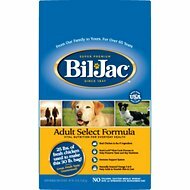 Have been using Bil Jac for at least 7 years and you can see how healthy it keeps our dogs. They like it soaked in water or dry! Give Bil Jac the kibble in water test by watching it in a glass of water dissolve and any other kibble of any other brand will never change form. Your dog will love you for it! This is THE BEST product to keep my English Bulldog's weight under control, while not upsetting her sensitive tummy! I have six dogs, all rescues, several are over 10 years, and needed to be on a low-fat diet. They all love this food and eat it willingly. I'm very happy with the results. We have a fat Chihuahua and a lab that could lose a few lbs too! And though both love the food and are losing wieght, so glad i found this food, much cheaper than other diet food. Thanks Chewy!! This is the only food that I will feed all four of my dogs. They love it. They all have ideal weight for their breed. Pit and pit mixed. Plenty of energy and muscles as a result from the quality. Highly recommended. Just started using reduced fat feed. My dogs just scarf it right down.